For the last 25 years, nationalism has proved to be the Chinese Communist Party’s favorite ideology. Under Xi Jinping the Party’s commitment to the patriotic narrative has only strengthened. Last year Xi announced the creation of three new holidays, two of which are pointedly anti-Japanese. The first, on September 3, is called “Victory Day of the Chinese People’s War of Resistance Against Japanese Aggression” and will mark the end of the “World Anti-Fascist War.” The second, on December 13, is a national memorial day for the victims of the Nanjing Massacre. As China previously only had seven official holidays, the significance of embedding anti-Japanese sentiment into the national definition of what China “is” cannot be understated. Yet historically speaking the trend is a recent development, the term “Century of Humiliation” was not present in Chinese textbooks until 1990. What marked its introduction and brought about a new (historically speaking) Chinese nationalism was a crisis of legitimacy caused by the shifting global order of the late 1980s and early 1990s. I have told foreign guests that during the last ten years our biggest mistake was made in the field of education, primarily in ideological and political education — not just of students but of the people in general. We didn’t tell them enough about the need for hard struggle, about what China was like in the old days and what kind of a country it was to become. That was a serious error on our part. From then on, shaping the historical memory of “what China was like in the old days” in the eyes of its populace became the crux of the CCP’s patriotic education campaign. Emphasizing founding myths (“the old days of the party”), historical enemies (the Anti-Japanese War), and historical grievances (foreign aggression), the campaign stressed the CCP’s role in China’s historical struggle for national independence from foreign invaders. The amalgamation of these messages is meant to repeatedly convey a “fundamental truth” in the minds of its people; the CCP is the defender and savior of the Chinese nation. The difference between Mao’s nationalism and the new Chinese nationalism is a shift in national self-perception, from that of victor to victim, as Zheng Wang notes in his book Never Forget National Humiliation: Historical Memory in Chinese Politics and Foreign Relations. While Mao’s nationalism glorified the victorious revolution against the KMT and the Taiping Rebellion, new Chinese nationalism focuses on the century of humiliation (百年国耻) at the hand of foreigners and the joint CCP-KMT’s (verses exclusively the CCP’s) role in ending it. Both views legitimize the Party’s political rule. In Mao’s era, the hybrid Marxist-Leninist-Maoist ideology of class struggle gave raison d’être to the revolution; the modern version emphasizes the CCP as the savior of the Chinese nation. In emphasizing the nation post-Tiananmen Square, the CCP redirected youth anger and frustration away from its domestic failures to problems with foreign countries. Another notable difference is the inclusion of the KMT in the CCP’s narrative. As the 1996 Taiwan Strait Crisis demonstrated military force would not be a viable means of reaching one of its penultimate goal of reunification, the CCP has attempted to seduce Taiwan through diplo-economic means instead. By positively including the KMT in the inception of the People’s Republic of China, it seeks to re-anchor the “us vs. them” mentality from one of China vs. Taiwan/PRC vs. ROC/CCP vs. KMT to that of a unified China vs. the World. If we want to make the patriotic thoughts the core theme of our society, a very strong patriotic atmosphere must be created so that the people can be influenced and nurtured by the patriotic thoughts and spirit all times and everywhere in their daily life. It is the sacred duties for the press and publishing, radio, film and television departments of all levels to use advanced media technology to conduct patriotic education to the masses. In addition, most schools in China–from kindergarten to college–are under the State’s control, thus ensuring nearly all school officials are selected by the Ministry of Education’s local government branch. It is not hard to see why educated, young Chinese “rank among the most patriotic, establishment-supporting people you’ll meet.” Without a doubt the CCP’s patriotic education campaign has been wildly successful, but it has its limits. 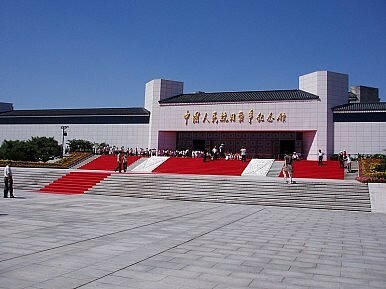 Last month marked the kickoff of patriotic build up to the September 3 military parade with the opening of the “Great Victory and Historical Contribution” exhibition at the Museum of the War of the Chinese People’s Resistance Against Japanese Aggression. The exhibit was inaugurated on July 7, the 78th anniversary of the Marco Polo Bridge Incident in 1937, considered the first battle of the Second Sino-Japanese War. We should not expect the trend of top-down nationalism (known as official nationalism) to lessen. China is at the historical apogee of its power, and nationalism along with continued economic growth has offered the CCP a silver bullet for addressing deep anxieties around its territorial integrity, social stability, and political legitimacy. Though nationalism is a double-edged sword that threatens its wielder as much as it protects it (as Jessica Chen Weiss has argued), the CCP has proved to be an apt student. As China’s economic growth continues to slow a change, let us hope the CCP has other tools besides war to once again re-legitimize its reign.